There are many articles on how to select a Christmas tree, but as a guy who has been involved with Christmas trees for a long time, I’d like to mention a few things that might make picking your tree more enjoyable. Clear your schedule – Christmas is a magical time for kids, and it can be a stressful time for parents. Don’t let stress overshadow the fun. About 99% of the people in the country are going to be shopping for a Christmas tree at the exact same time you are. That means a little patience will go a long way. If you visit a Christmas tree farm, it will be busy. But take your time and pick a tree that everyone likes. If you have kids, take a little extra time and walk through the barns and displays, drink some hot chocolate, and make an afternoon of it. Make it an event, not just an exercise in picking a tree. Know what you like – There are a lot of different types of trees, and they have different characteristics. Do you want a tree that smells great? Do you need a tree that is tall and skinny, or fat and bushy? Do you want to put your tree up early in the season, or closer to the holiday? Here’s a tip: the Blue Spruce is a beautiful tree, but not a great choice if you are going to put up early in the holiday season. Firs tend to hold their needles longer and are more fragrant than pines and spruces. Some trees have prickly needles, other are soft. Do you have heavy weight ornament? If so, pick a tree that has sturdy branches. To find out what type of tree will work best for you family, please visit our fresh Christmas Trees page. Online Companies– This is the next best thing to going to the farm and cutting your own tree. 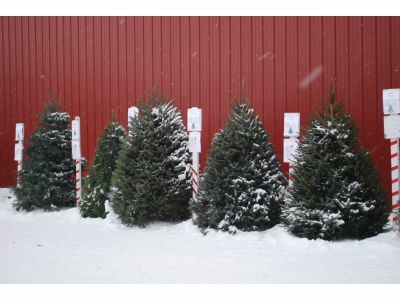 Look for a company that is an extension of a family Christmas tree farm, not a Christmas tree factory. This is a great option for receiving a fresh cut, number 1 quality tree that is conveniently delivered to your door. If a company has been in business for 10 or more years, it is a pretty safe bet they’re a quality company. Be cautious of nationally recognized/big named companies that don’t grow their own trees. They are typically a clearing house and don’t have a first hand knowledge of trees. Big Box Stores - Not a bad choice if cost is the driving factor. These trees come from tree brokers who work with growers and frequently sell “Number 2” quality trees. These are not the highest quality trees, but can still be decorated nicely and look well in home. They typically have a bad spot or side, but if used in a corner, that can be hidden. Also cut well in advance of the season, so make sure you pick a reasonably fresh tree. Christmas Tree lots – Before the online option became available, tree lots were the about the only choice available for many people. Even today, this remains a popular way to buy a tree. This is a quick and easy way to grab a tree. Most of the trees sold on these lots are purchased from agents who arrange the delivery of trees to the lots from farms in the upper Midwest, Northeast and Pacific Northwest. Wholesale cutting of trees needs to start in late October to allow time for processing, transportation, and the set up of the Christmas tree lot. By the time many of these trees are sold, it has been about a month since it was cut, and by the time Christmas arrives, it has cut for a 2 months. If selecting a tree from a lot, ask how long it has been cut. Run you hands over the branches see if an excessive number of needles come off. Bury your nose in the tree and see if you can smell a strong scent. If it doesn’t look fresh, feel fresh and smell fresh, you may want to keep looking to find a fresher tree. Regardless of where you pick your tree, have some fun. As biased as we are towards fresh cut Christmas trees, we know that a tree won’t make or break your family’s holiday. A beautiful, fresh Christmas tree can enhance the holiday spirit in your home. But ultimately, it is up to you to make the holiday memorable.